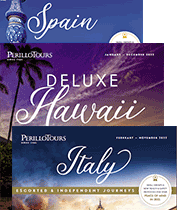 When it comes to Hawaii tour guides, Perillo Tours works with only the best of the best. Bert is the undisputed king of tour leaders in the Hawaiian Islands. He combines his vast knowledge of Hawaii with his outrageous sense of humor. And in case you didn’t know – your family tree includes a cousin BERT in Hawaii! Paul is one of the best tour leaders in Hawaii today. He performed with Don Ho - and he’ll sing for you too! He’s also one of the last native speakers of the Hawaiian language. Paul embodies all the warmth of the Hawaiian sun. David has been a leading expert in Hawaiian tourism for 25 years. His creativity turns a humdrum vacation into the experience of a lifetime! If you meet David you’ll agree - his “Aloha Spirit” is contagious. Esther, our “secret weapon,” insures that your bags, transfers, rooms, flights, tours and activities run like clockwork. When we say your Perillo vacation is carefree – Esther is the reason!